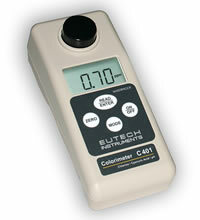 Eutech’s latest range of laboratory grade microprocessorbased portable waterproof colorimeters measure Chlorine (Free and Total), Cyanuric Acid, pH, Chlorine Dioxide, Bromine and Ozone with quick, accurate and repeatable results. The meters are easy to use because of their simple, intuitive and direct user interface. Guiding messages and self-diagnostics are displayed on a large custom-made liquid crystal display (LCD). Each meter comes with reagents and sample vials ina rugged carrying case for swift testing on the go. This family of colorimeters is designed for reliable and convenient water analysis in swimming pools, spas, public utilities, industrial wastewater plants, municipal water, treated water, water conditioning systems and paper and pulp mills. Select from our wide range of models, designed to meet your application needs. 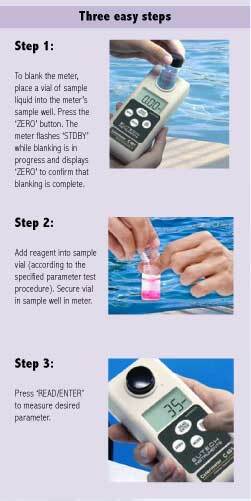 capabilities while using only one-vial-one-sachet per test. or flip covers are required. individual sachets for ease of use. The meters are capable of more than three thousand tests on a set of four new ‘AAA’ alkaline batteries. The auto power-off function activates after ten minutes of non-use to conserve battery life. The lightweight meters have a waterproof IP67-rated housing. They float if accidentally dropped in water. The effectiveness of the disinfectants used depends on your system’s overall water chemistry, and not just on the disinfectants’ concentrations alone. Find out more about the measurement of each parameter here. 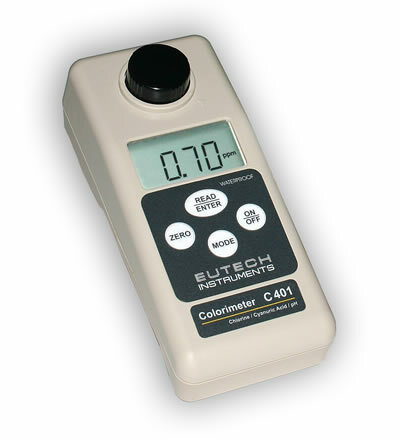 Click here for more information on parameters measured in colorimetry.